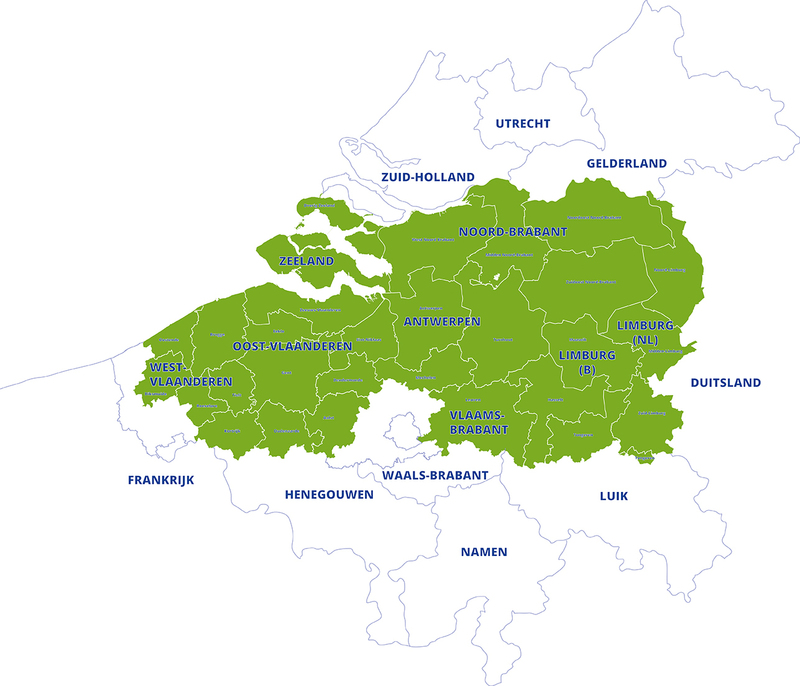 The Interreg V-program between the Netherlands and Flanders (Belgium) is carried out on the territory of (parts of) the five Flemish provinces and the three southern provinces of The Netherlands. In Flanders these are the provinces Antwerp, East-Flanders, Flemish-Brabant, Limburg and West-Flanders. For the Netherlands this includes the provinces of Limburg, North-Brabant and Zeeland. These partners, together with the Flanders Innovation & Entrepeneurship Agency and the Dutch ministry of Economic Affairs drew up the ‘Cooperation Program Interreg V A Flanders-The Netherlands' for the 2014-2020 program period. Within the Interreg-programme, crossborder projects are subsidized. This crossborder nature of projects is obviously essential: in each project, partners should be involved from both sides of the border. In general, these partners are localized in the program area, although this is not necessarily the case. If it adds a surplus value to the project and the program area, you can involve partners from outside the program area, especially from nearby economic centers such as, for example, the Rotterdam – Rijnmond (mainport) area. To strengthen the competitiveness of our economy, it is necessary to continue to invest in research and development. Innovation is therefore the main priority of our program. Companies, especially SME’s, as well as knowledge institutes play an important role. SME’s constitute more than 99.7% of the dutch and Flemish companies and provide jobs to more than 65% of the working population. However, the importance of large companies should not be underestimated. Interreg Flanders - Netherlands receives € 152 million from the European Regional Development Fund (ERDF) to invest between 2014 and 2020 in valuable cross-border projects. This is significantly more than in the previous period. For research and innovation 40% of the budget will be reserved. 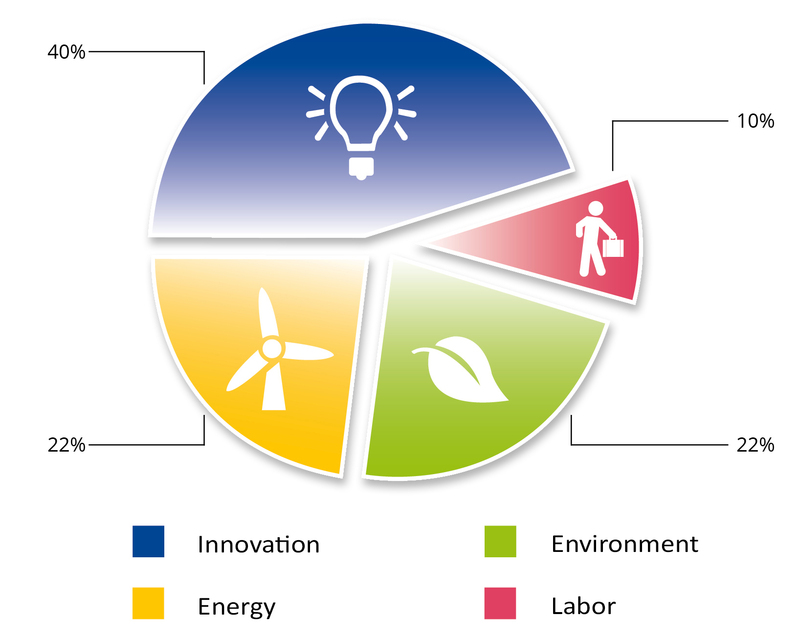 The priorities energy and environment are each given 20% and 10% is provided for labor. The program subsidises to 50% of the total cost of a project. Additionally you can use co-financing from private investors or governments. Within the sphere of innovation, the program specifically targets investment in the so-called ‘smart specialization’ sectors of (sustainable) logistics, bio-based economy, chemistry and materials, energy, life sciences and health, agro-food, nano- and microelectronics. On this website, all project descriptions are in dutch, the common language for the dutch as well as the Flemish part of the program area. However, for a few of our strongest projects we offer an English description as well. The management and implementation of the program is accomplished in partnership between Flanders, the Netherlands and the provinces Antwerp, East-Flanders, Flemish-Brabant, Limburg, and West-Flanders (Flanders) and Limburg, North-Brabant and Zeeland (the Netherlands). The Supervisory Committee decides on the submitted project proposals. This Committee consists of representatives of both the Member States (Flanders and the Netherlands), the eight deputies of the partner provinces and representatives of economic and social partners and civil society. For the implementation of the program, a joint dutch-flemish secretariat was set up in the centrally located city of Antwerp. For any further questions on the Interreg Flanders-The Netherlands program, its projects or the possibilities to submit a project proposal, please contact us at info@grensregio.eu.